as they have the color aerial film processor that we used for many years! The following information was left on our site for reference information! We have put together a comparison page for IR Film processing that will be of interest to the professional market as well. If you wish to review this information see here. Currently over 98% of our film processing is completed and shipped out to clients the same day it is received. Our normal turnaround time for processing is 24 hours. 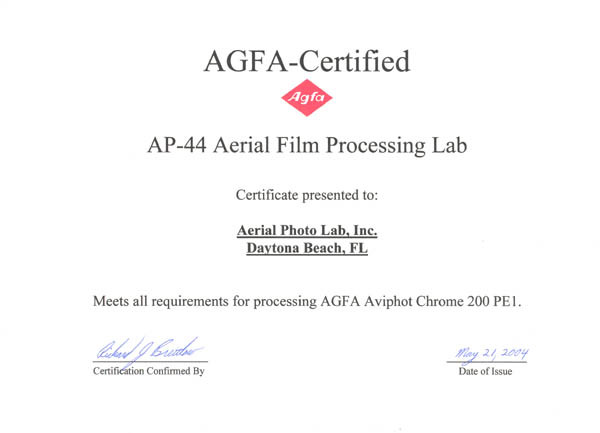 Agfa and Kodak are two major manufacturers of aerial film and aerial photo lab supplies. Aerial Photo Lab, Inc. now utilizes primarily Agfa processing supplies due to a notable trend of preference for various Agfa films by our clientele. Agfa supplies meet the demand for our Transparency film processing (ASP44 – E6) in particular. Agfa supplies products to our lab which Kodak has eliminated from the Kodak product line. As a result, with Agfa, Aerial Photo Lab, Inc. continues to provide the same superior imagery and service that our clients have always enjoyed! Maco / Rollei B&W 400 Infrared Film - We are working to return B&W IR film to the aerial & professional market. This film can be nearly all sizes. We are continually working with film manufacturers on film development and improvement. We are also working very closely with Agfa in trying to bring some of the film formats that are being (and have been) dropped by Kodak over the last several years. If you are looking for specific films please let us know and we will help you. We have received several rolls of film to be processed (or to be printed) that arrived without being taped on the outside wrap. The lack of tape on the outside wrap of film allows the film to become loose and move around inside the can. This movement against the side of the can and the spool can cause damage. There are times a spool is received bent inside the can and if the film is loose there can be damage and if the spool is bent in shipping the damage can be severe. We have received film that has gotten torn and kinked in shipping with no damage to the box or can.